Follow the below instructions on setting up payment for your providers services. You can use a credit card or ACH (eCheck), which comes directly from your checking account. You are never charged any fees for this! Once you have this setup you can set it and forget it. 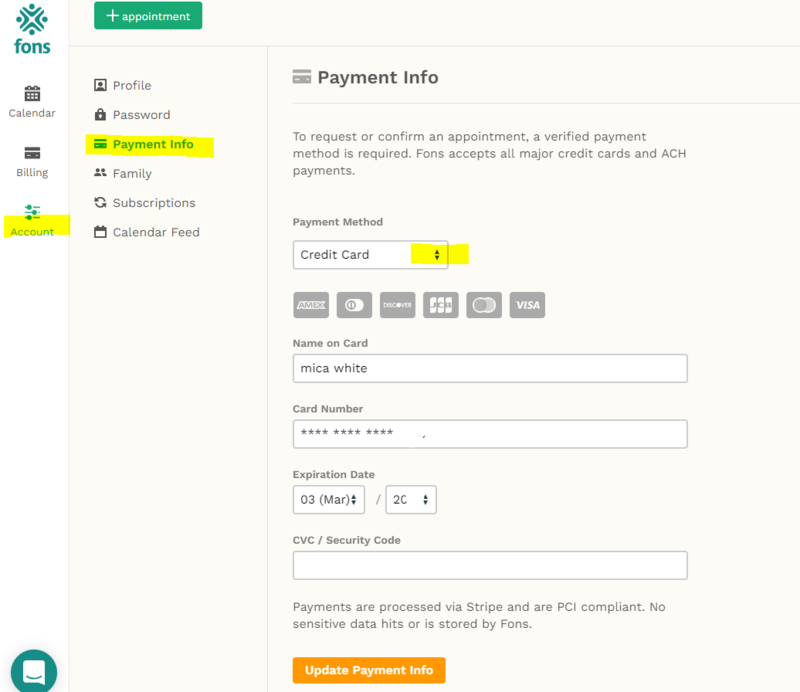 If their is an issue with your payment method like card expiration, you will be notified via email. If you receive an email that your payment method has an issue, you should attend to this as soon as possible to avoid payments for scheduled appointments. Log into Fons and navigate to the "profile tab", "payment info"
Choose either credit card or ACH from the drop down. Note: if you choose ACH you will receive two micro-deposits within a couple of days, you will have to input these micro-deposits in this same tab to complete the setup. This step is for your account security to verify it is actually your account. Click "Update Payment" and your card or bank will be charged once either the after the first lesson occurs or a selected date by your provider for subscriptions.